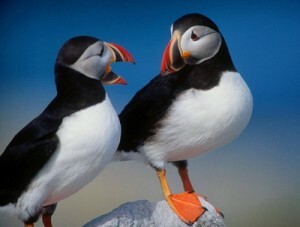 Seal Island, south of Isle au Haut, is home to a summer colony of nesting puffins. They have brightly colored beaks during the breeding season. 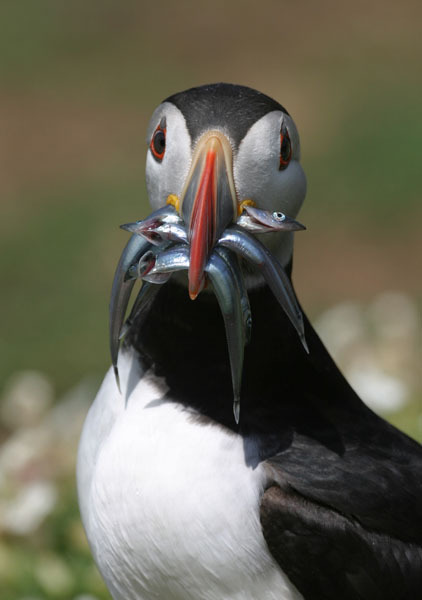 They feed primarily by diving in the water, and breed in large colonies on coastal cliffs or offshore islands, nesting in crevices among rocks or in burrows in the soil. Their short wings are adapted for swimming with a flying technique under water. Fares are $75.00 for adults, $45.00 under age 12. Advance payment is required to secure reservations; cash, VISA, American Express or Mastercard, refundable for cancellations 7 days or more before cruise date. Call (207) 367-5193.